I really enjoyed working with Mike & Pareeka leading up to their wedding, and on the day as well – they are both a really fun, loving, happy go couple that make it hard NOT to get addicted to their personalities. They are just so cute together, and you can really see why the love each other so much. However that being said – there was alot of logistics & planning in their wedding! Here’s some of the things I had to work with them on. Regular Skype Video Chats as they both live overseas in Dubai. Co-ordinating the timings, music & run service. But, I really wanted to help make their day amazing and do whatever it takes, and I’m glad I did, because it ended up being a great day! The afternoon started off with a Hindi/Indian Wedding Ceremony, which featured a stunning Gazebo Setup and Red Carpet Runway. Guests started arriving around 2:30pm into the room to take their seats, and it wasn’t long until Mike’s car arrived with his Dad beeping the horn to let everyone know he was here. (This was soooo funny to watch). Mike’s dad was such a fun character – you can see where he gets it from! The Ceremony was really intimate – with all their family & friends as we heard from the Indian pastor – Surend Sharma who walked us through the ceremony and what was happening as it was part Hindi, part English. There was lots of exchanges, traditions, and messages shared and also a small Fire Ceremony as well. Although the Ceremony did run a little over time, we still managed to catch the rest of the night up to schedule. I also helped with some family photos and group photos just to try and move things along a little faster after the Ceremony. Guests enjoyed some lawn games outside, along with the Photobooth Station that I helped setup and some props as well. We had some Bollywood Dancers from Sari Bollywood – who came in and showed the guests some Bollywood Dancing, and we even got some guests up onto the Dance Floor to partake in some of the dancing styles. We had some Speeches from a few close friends & family members, including a special song sung by the groom – Mike to the tune of “Grow Old with You” from “The Wedding Singer” and then some Video Messages from friends overseas that I asked to record and send to me which we put up on a Projector. 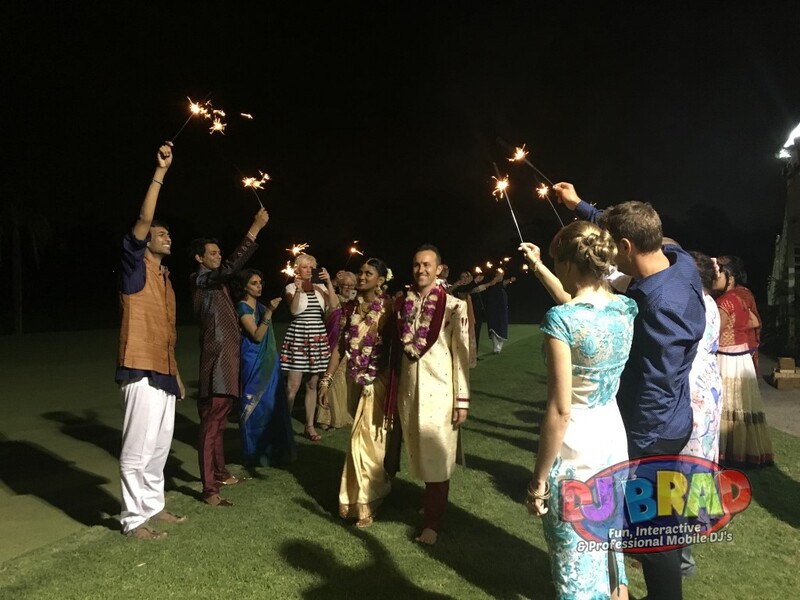 As the night came to a close, and the Bus was ready to take guests back to their Hotel/Accommodation in the city, I got everyone outside for a Sparkler Farewell on the grass for Mike & Pareeka to run through as they headed off home. I couldn’t find the 6th star in the review rating otherwise I would have used it to describe DJ Brad’s services. DJ Brad took care of our wedding day by offering both DJ & MC services on the 11th of March 2017 in Wynnum, Brisbane. My wife and I live overseas and contacted Brad at the end of January 2017 to organize the last day of our Indian wedding in Brisbane. Brad videoconferenced with us via Skype as he was really interested in getting to know us in order to provide a tailored service that would meet our expectations for our big day. And he truly did. Brad has been extremely accommodating, reliable and friendly. A genuinely resourceful chap who you would definitely like to have around in times of need. Our wedding day was organized over three Skype Videoconferences, a dozen emails (which he always promptly replied to) and a face-to-face meeting a week prior to the wedding day. On our wedding day, Brad did an outstanding job. He dealt beautifully with the various delays to the program, needs of the photographer and videographer and hall management. He made our day even more special by contacting our friends and family around the world who could not attend the wedding and put together video messages from all of them which he had ready to show us at the reception. Working with Brad has been a stress free experience and it took a load off our shoulders knowing that there was someone else who was as concerned as we were about making our day perfect. We would recommend to all couples out there who really want to enjoy their wedding day and the days leading up to it, to consider working with Brad. Thank you Brad for all your hard work so that we could relax and enjoy our wedding day.